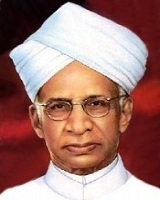 Sarvepalli Radhakrishna 5 September 1888 17 April 1975 Indian Sarvepalli Veeraswami Sitamma President Indian philosopher, statesman, first Vice President of India (1952-1962) and the second President of India from (1962-1967). He was awarded several high awards during his life, 'Knighthood' in 1931, 'The Bharat Ratna', the highest civilian award in India, in 1954. A list of popular sarvepalli radhakrishna quotes are given below.